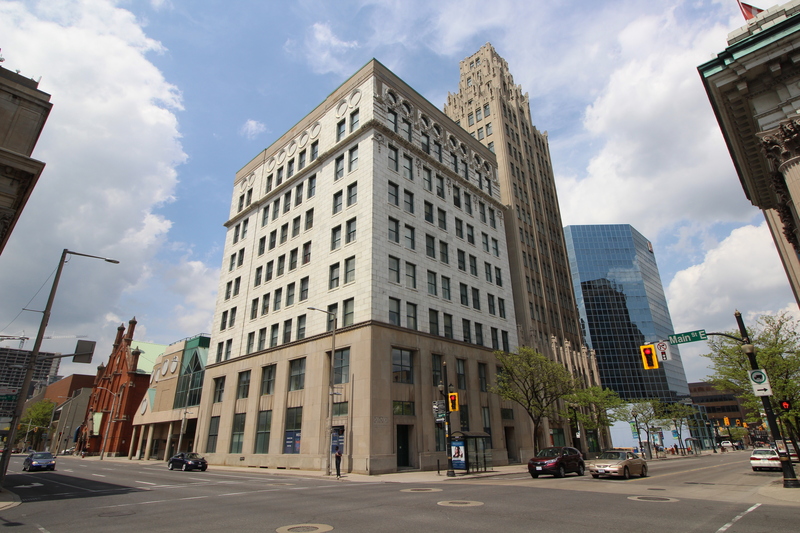 The Federal Life Assurance Company building sits amongst some of the Hamilton’s most cherished buildings, yet it’s history has been overlooked. 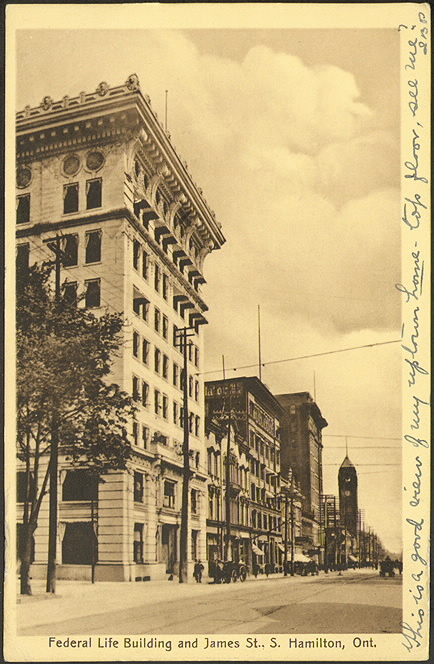 Completed in 1906 and designed by Montreal-based architects Samuel A. Finley and David J. Spence of Finley and Spence, this Beaux-Arts building is composed of neo-classical elements and designed in the Commercial Style. 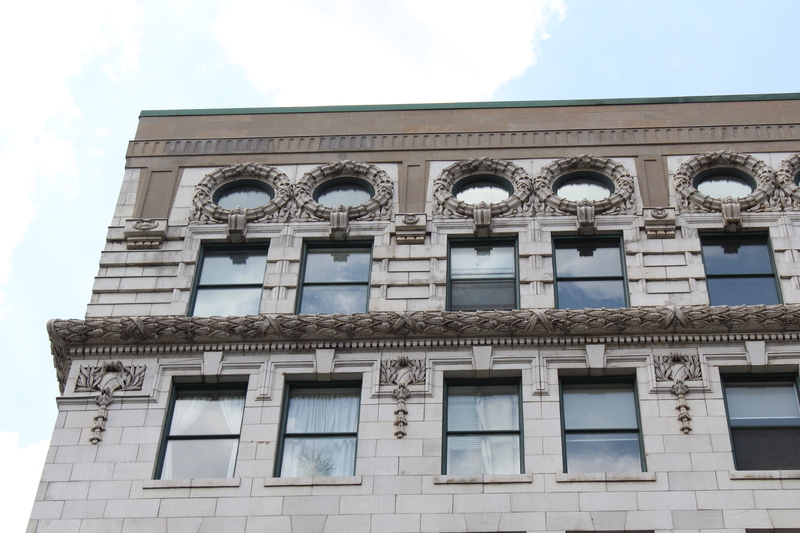 A style made popular by Louis Sullivan and the Chicago School of Architecture. At 9-storeys the Federal Assurance Company building is just shy of being Hamilton’s first steel framed skyscraper (one storey short of the 10-storey minimum). It was constructed with steel and reinforced concrete, supporting the glazed terracotta façade. The commercial style was breakthrough for the time. Its massing and height were an evolution from its heavier wood and stone predecessors. A popular theory about the commercial style is the building symbolizes a classical column, divided in three sections. The first section, the base of the building, is less decorative. Composed of reinforced concrete, with tall windows, spandrels, and detailed window reveals, but little else. White glazed terracotta and double-hung windows make up the middle of the building, or the shaft of the column. 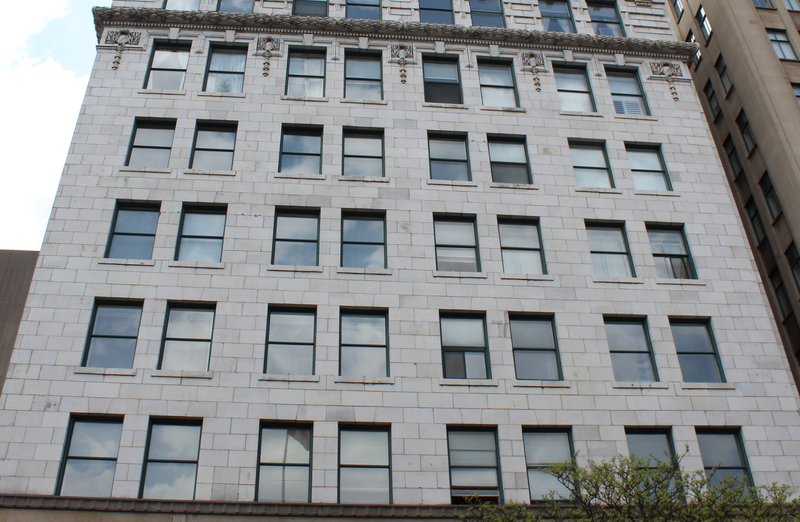 The vertical gaps between every second window emphasize the buildings height and draw the eyes up. Before the top section of the metaphorical column there are ornamental crests surrounded by wreaths and windows with a continuous band of decorative lintels. The top two-stories, or the capital, are separated by a horizontal band of foliage and dentils. More ornamental foliage is added to attract the eye, while the top floor is complimented with porthole windows surrounded by intricate wreaths. On the southern façade the portholes are just reliefs with no glass or ornament, but still add to the decorative effect and keep with the buildings characteristics. The roof was originally capped with a large projecting cornice, but it has since been removed, leaving the top of the building naked. Other changes have been made to the building, as well. Some windows have been added and removed from the west side of the building. 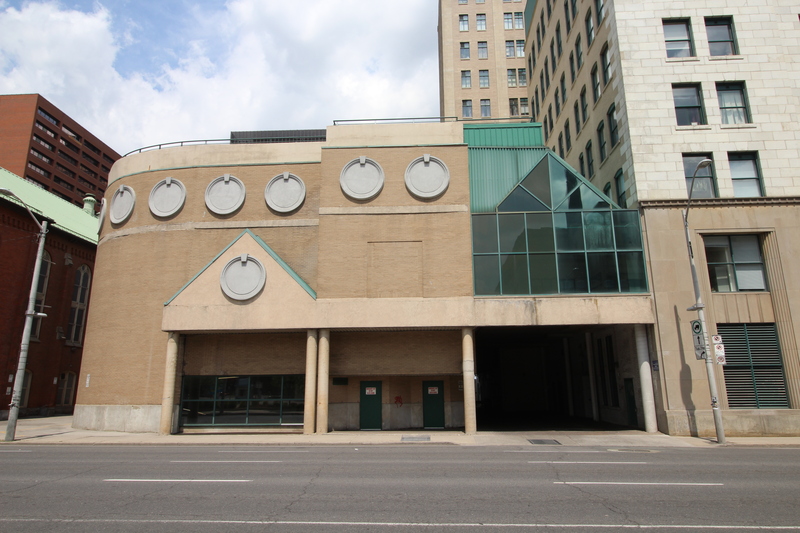 There is also a two-story post-modern parking garage added to the back of the building from the early 1990s. The addition features simple brickwork, columns, green corrugated steel, tinted glass windows, and more porthole reliefs. 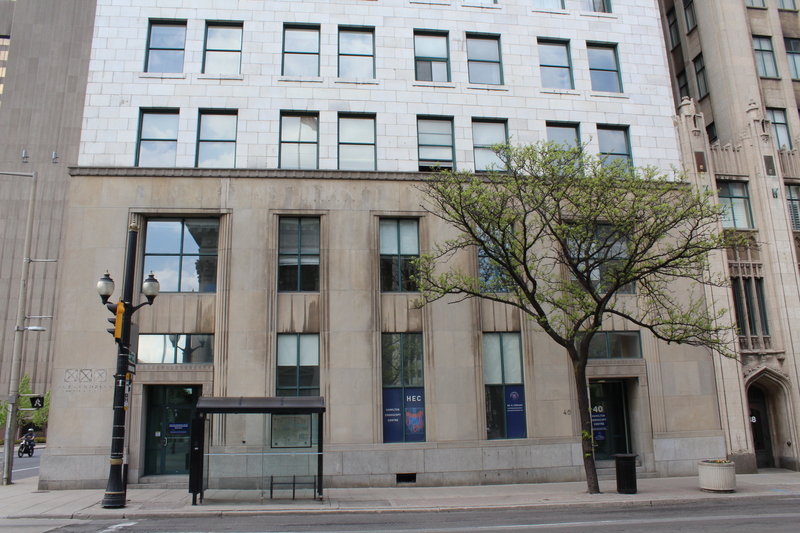 Originally built for the Federal Life Assurance Company, the building houses both commercial and residential tenants.